Kirk is perhaps better placed among writers like Wilson Carey McWilliams or Christopher Lasch as representing a "liberal" tradition less influenced by the Enlightenment and more by the small-town Protestantism that characterized much of this country until quite recently. This tradition favored liberty, including economic liberty, but mistrusted centralization, bigness, and uniformity. (Birzer even gently criticizes Kirk for his too-close association with National Review, against the advice even of Eliot. 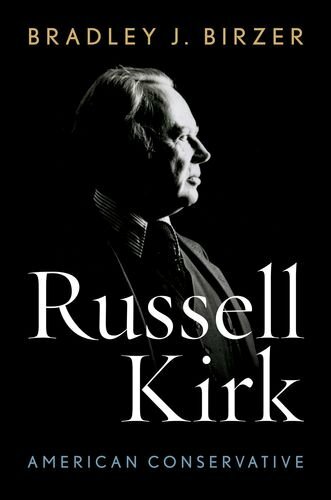 Birzer argues that the pressure of producing a regular column reduced Kirk's output of more lasting works and also tarnished his reputation as a serious thinker by association. The simple explanation is likely that Kirk, as a working writer, needed the money.) This book is itself a great achievement of the imagination, and should serve as a gateway to one of the last century's most important thinkers. Gerald J. Russello is editor of the University Bookman and author of The Postmodern Imagination of Russell Kirk.